Full Hearts: Happy Valentine's Day! Valentine's Day started a day early at our house. 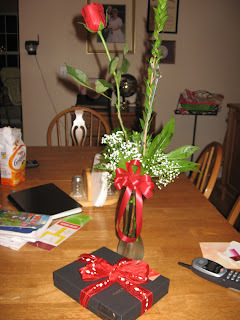 Travis surprised me this evening with a rose and a box of yummy Harry London gourmet chocolates. He said I had to wait until tomorrow for the rest of my goodies. I'm such a spoiled wife! Hug your loved ones tight, be sure to tell that special someone that you love them. Have a great *heart* day! !